It’s true. I’ve made both of these today, and in principle, the one on the hanger is a free gift! The one on the dress form is the t-shirt version of the shift dress which is in both the latest GBSB book and was free with the latest edition of Sew. I think I used the Sew pattern as it was easier to fit together and trace. The pattern looked very narrow and the basic idea was to make a t-shirt as a form of wearable ‘muslin’ for the dress. Conclusion: the dress will be OK. It skims the hips with room to spare and is not tight round the stomach. I know that the guidelines say that the fabric length recommended is to accommodate the largest size, and I bought 1.8m. I quickly realised that if I cut the t-shirt with the fabric folded into the centre, I might get something else out of it. The pattern I have that requires least fabric is New Look 6217, also free with Sew, which I made up in white a few weeks ago. The shift dress pattern is designed for woven fabric, but I have used a fairly stable knit. 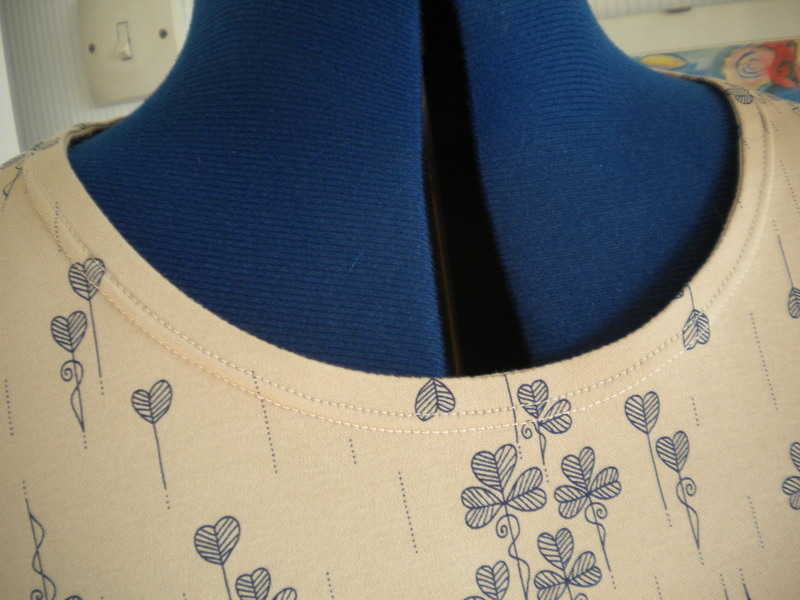 This was partly to make the resulting garment more reliably ‘wearable’ and I also fancied the shamrock design. I have not used a zip. 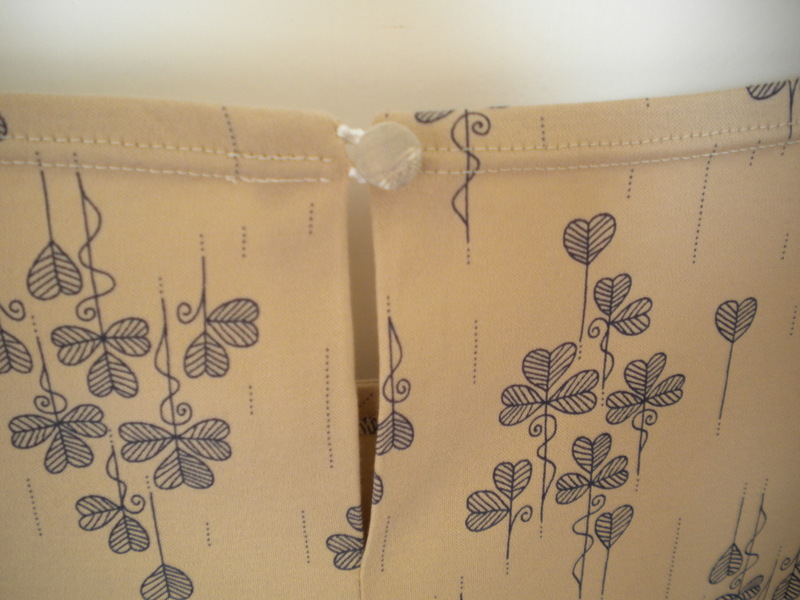 I quickly sewed the side seams with a machine tack, tried it on and decided that I didn’t need one. I cut out both garments at the same time, and made them up together, without referring to either set of instructions. My objective was to get synergies from the use of the sewing machine, with and without the twin needle, the over-locker and the iron. And that has, in general, worked! I don’t think I have ever started and finished two things in the same day. Sometimes I didn’t actually know which one I was sewing! The fabric is from Barry’s. Its easy to sew, but was a pain to lie flat when cutting out. It sticks to itself, which is great when you are sewing, but was sometimes a nuisance for other processes. It may yet prove to be a pain when wearing. I feel that I have learned a lot about using the twin needle this week. This has resulted in one of my best efforts. Golden rules: Always have sufficient fabric to the right of the needle to be flattened by the foot. Press before you sew. (I pretty much always do that anyway). Take your time. I don’t always do the first and last, but will in future. Maybe the sticky fabric helped a bit as well. And to finish the Kwik Sew top I had to go to my button box, find the most suitable button, and then work yet another hand worked loop. Beige thread would have been better, but you can’t see much of the white thread. I had packed away all of the sewing things, ready to go to work….. I have made three things since Thursday. Now I will pack them all away again. 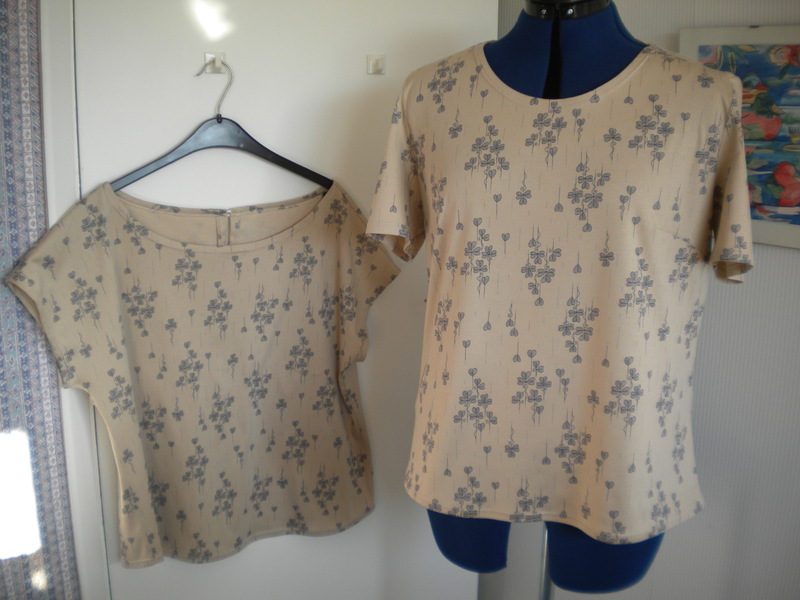 This entry was posted on April 18, 2015 by ann hebden in Fashion, GBSB, Sewing, Tops and tagged Fashion, GBSB, Handmade, knits, Sewing, t-shirts, Tops.